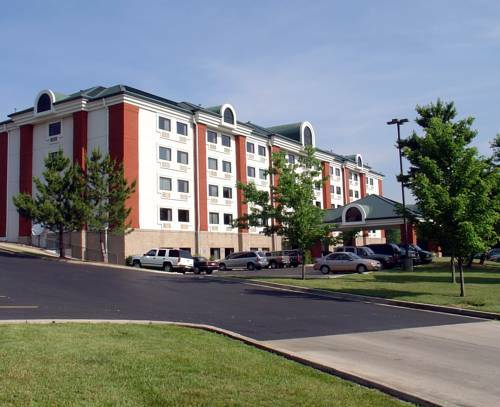 Hotel's Located in Branson, MO Near The StripBoasting a modern design and contemporary decor, the Holiday Inn Express Hotel Branson - Green Mountain Drive is located in the Thousand Hills development, just one block from The Strip. Situated in the heart of the Branson theatre district, this lodging offers all the comforts of home.From outdoor recreation to theatrical shows, there's so much to see and do in Branson, and lodging at this hotel offers you proximity to the area's best attractions. Catch a show at the nearby Andy Williams Moon River Theatre and King's Castle Theatre. Looking to do a little shopping? The Grand Village has a variety of choices, while the nearby shops at Tanger Outlets offer discount prices on your favorite brands. Additionally, we are near the 18-hole Thousand Hills Golf Course.If business brings you to Branson, the hotel's accommodations are sure to have everything you need. There is free Wi-Fi access throughout the hotel, and we also offer computer and print services in the lobby. The breakfast area doubles as a meeting room and can accommodate 60 people.Outstanding service and excellent amenities found here are unmatched by other Branson hotels. With an indoor pool, you can enjoy year-round swimming, and the Fitness Center helps you maintain your workout routine. The hotel also has a game room and hot tub. Join us each morning for the free Express Start Breakfast Bar. Make your reservations today! Ruby Tuesday: Chain restaurant offering a variety filled salad bar in addition to menu service. Mel's Hard Luck Diner: Diner and fountain bar with singing waiters and waitresses. Outback Steak and Oyster Bar: Variety restaurant including steaks, oysters, chicken and pork chops. This is not the chain restaurant. Childrens's program - Miniature golf and go karts located within one mile of the hotel. Fun for kids of all ages. Tanger OutletsTanger Outlets outdoor shopping mall located only one mile from the hotel. Outdoor mall offers a variety of name brand outlet stores for your shopping convenience. thousand hills golf coursepublic 18 hole award winning golf course. King's Castle TheatreFeaturing several shows daily. Call the hotel for tickets. Andy Williams Performing Arts TheaterOffering several shows throughout the year. Call the hotel for tickets. Sight and Sound TheatreMust see inspirational music theater, where the Bible comes to life. Now showing: SAMSON. Call the hotel for tickets. Presley's TheaterOne of Branson's oldest performing shows on the strip. Call the hotel for tickets. Branson's Famous BaldknobbersOne of the longest running shows in Branson. Call the hotel for tickets. Silver Dollar City - Theme ParkFamily amusement park where there's something always happening! Get one or two day passes at the hotel. White Water ParkSeasonal water park where fantastic outdoor wet adventure awaits you. Get tickets at the hotel. Pierce Arrow TheatreOffering Pierce Arrow Show, Doug Gabriel Show, and NEW Decades Show. Get your tickets at the hotel. Grand Country Music HallOffering a variety of music shows daily. Get your tickets at the hotel. Dolly Parton's StampedeBranson's most fun place to eat! Get your tickets at the hotel. Pirate's Cove Miniature GolfSeasonal outdoor miniature golf course.